It took me awhile to get hooked and to keep the characters straight because there are quite a few. I listened to the last five hours or so, over the course of one day, even finishing the last 20 minutes in the car with earbuds in, while my husband drove to go get something to eat. I had to know the ending. 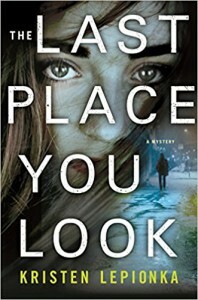 The Last Place You Look has a very flawed main character, who likes to drink, a lot…which may be why she didn't suspect "who" it was earlier on, like I did (but I couldn't remember their name, of course). I really liked the way everything tied together by the end, it was very cleverly done.